November 2011 – Army painting finished! 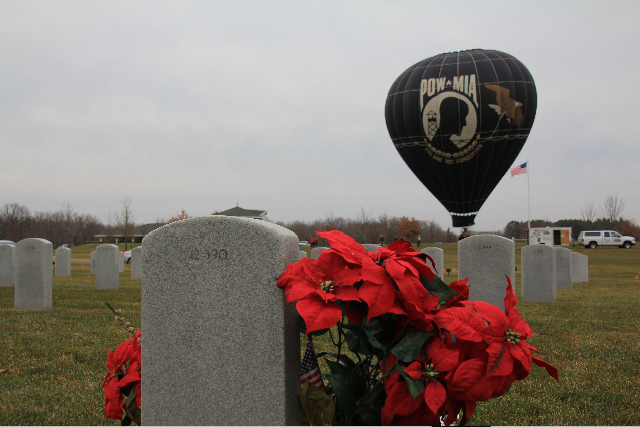 POW/MIA “Freedom Flight” balloon was on display during the unveiling of the Army painting on November 25th. Photo credit: Brad Veenstra with major thanks to Jim Tuorila and his team for getting the balloon to the event. Video courtesy of Madiha Mirza and Emily Schnacky, two UMD students. 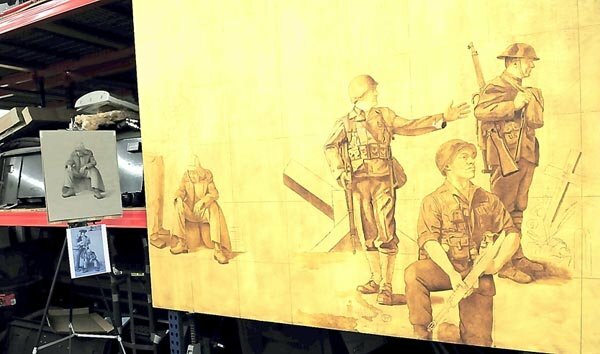 The first of five 8-foot by 10-foot oil paintings in the veterans art project, is under way and is about one-third completed. 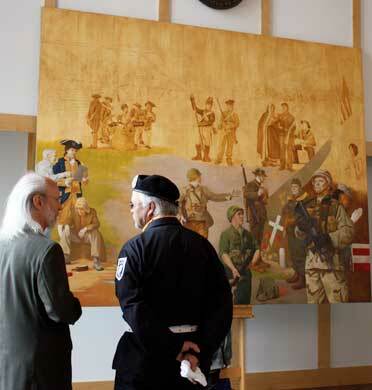 During Memorial Day services May 29, the Army painting was on display at the Minnesota State Veterans Cemetery’s Committal Hall, where it will eventually hang, with four others, once it is finished. 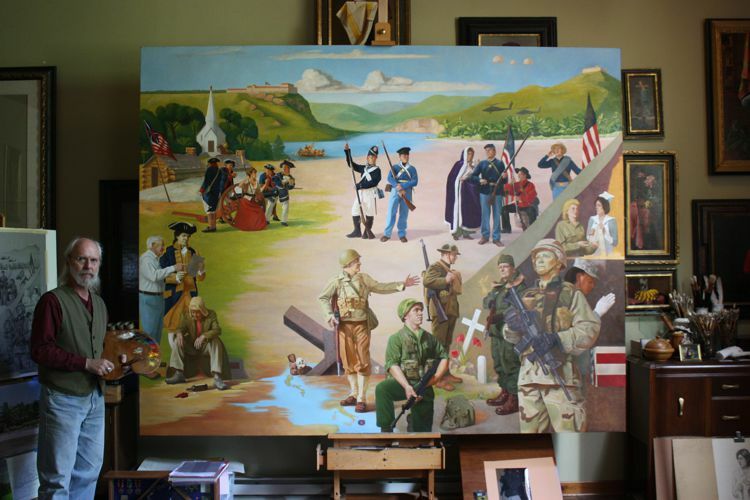 World-renowned artist and Little Falls resident, Charles G. Kapsner, has been commissioned to design and create the $450,000 project, depicting the history of the five branches of the U.S. Armed Forces: the Army, Navy, Air Force, Marine Corps, and Coast Guard. 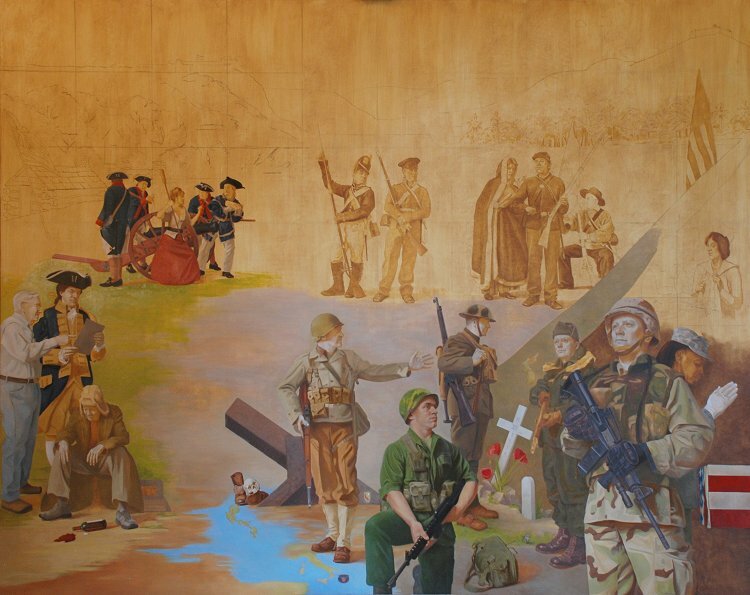 The project’s full name is “Looking to the Past, Present, and Future: A Veterans Educational Historic Project,” although its often shortened to Veterans Art Project. Kapsner’s goal is to finish the Army composition in early to late fall. The artist said he is looking forward to the remaining portions of the painting. “I’m looking forward to the little vignette in the upper left hand corner,” he said. 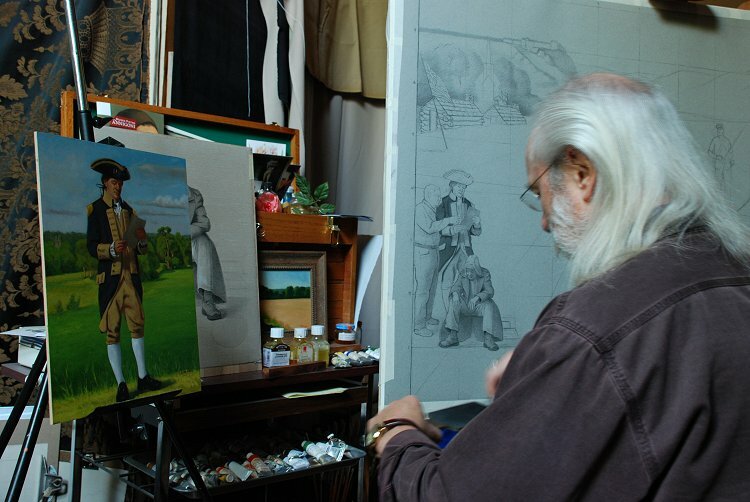 It will depict the Revolutionary War, Paul Revere, Washington crossing the Delaware and more. “Our story begins in 1775 to present, and in the course of America goes back several hundred years — that’s where it all started,” he said. Kapsner chose to start with the Army piece because he had the most knowledge about this branch of the military. His father was in the Army. And Gordon Gerling, whose brainchild sparked the project, provided story lines for Kapsner. About 40 different story lines will be portrayed in the paintings, he said. “There is a lot of American history,” said Kapsner, and it is his purpose to find which ones relate best to the each of the branches of the Armed Forces. Once the Army composition is complete, he will begin in earnest on the Navy composition. 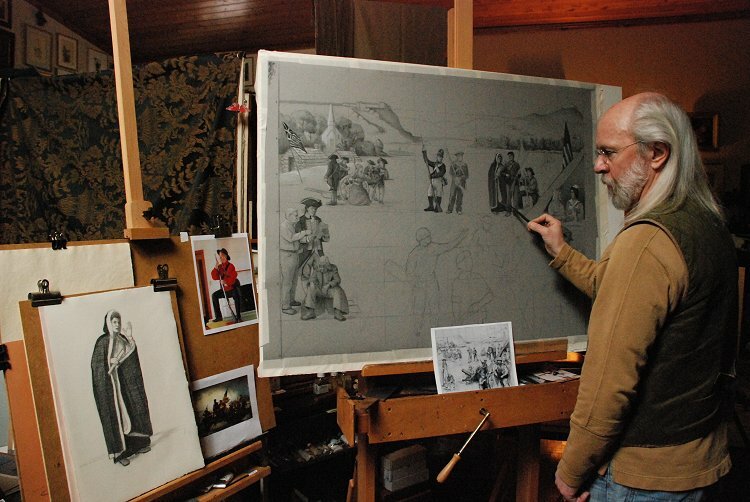 Although Kapsner uses local people as models, he said they are not the focus of the painting, but portray a cast of characters representing different eras. Kapsner has stayed pretty close to Minnesota while researching the Army, but has traveled to Washington, D.C., Seattle, Wash. and San Diego, Calif. to research the Navy. He will travel more as he delves into the other branches. “Those journeys will begin again when I begin work on the Navy painting and the other branches of the military,” he said. Kapsner said during the showing of the painting, he received many comments and words of thanks for his work. He pointed out that the lieutenant colonel standing next to Gordon Gerling in the Army composition, had an uncle in the Continental Army — seven generations ago. “We all have a vested interest in this and it really does pay homage to veterans,” he said. Henry C. McKinney, retired rear admiral of the U.S. Navy, said there is no other monument like this in the country, as far as the approach Kapsner is taking. “This memorial will be unique. 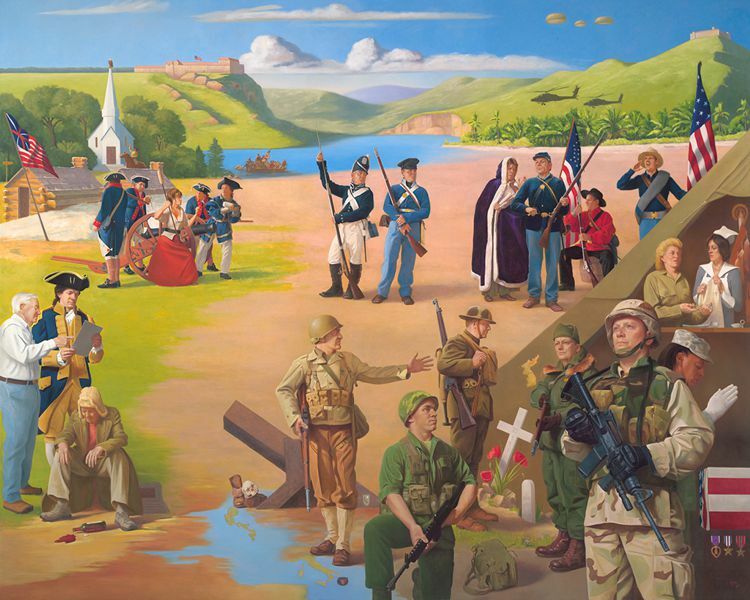 Not only will the magnificent paintings honoring each of our military services, but they will serve as an inspiration to all Americans,” McKinney is quoted as saying in the project brochure. Kapsner said the paintings will tell a story that focuses on individuals, trials and tribulations, offering the viewer a look into history and an understanding of what soldiers go through in combat zones. Retired Major General Larry Shellito told Kapsner the little tin can on the ground evoked memories of his time in Vietnam. The can was carried by the soldiers and used as a hand warmer and to cook rations. “Sort of like little life support systems,” said Kapsner. Retired Air Force Sgt. Dennis Houg of Rice, who also served in Vietnam, saw the painting. One story told, said Houg, is in the image in the bottom left corner. A little more than $100,000 has been donated or pledged for the $450,000 project, said Susy Prosapio, who serves on the Veterans Art Project committee. Contributions by individuals, corporations or civic organizations of $1,000 or more will be recognized on a granite memorial to be located in the lobby of the Minnesota State Veterans Cemetery Committal Hall. The committee has several other recognition levels as well, and a donation can be made in honor or memory of a particular member of the military. To offer support to the project, checks should be made out to “Initiative Foundation” with “Veterans Art Project” in the memo line. They can be sent directly to the Initiative Foundation at: 405 First St. S.E., Little Falls, MN 56345. If the donation is in honor/memory of someone, that should be noted in an attached letter with contact information for the donor so the committee can follow-up for more information if necessary. Using a digital projector, Mr. Kapsner traces the figures onto the canvas. Early painting of the foreground figures. View color studies and character sketches. 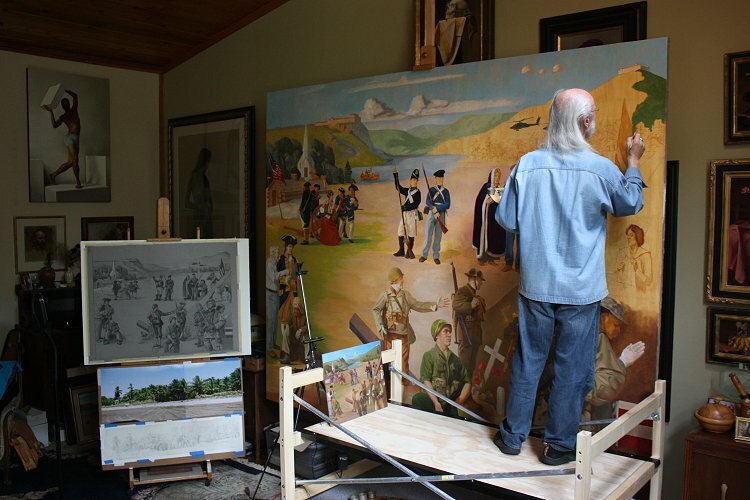 LITTLE FALLS – Artist Charles Kapsner stepped back from the giant canvas with paint brush in hand. “Until this is here, it’s been hard for people to visualize it,” he said. 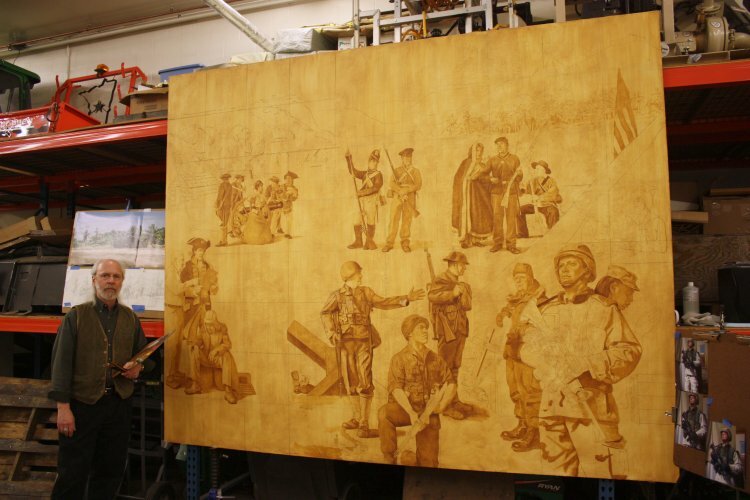 On the canvas soldiers are now taking shape as drawings amid a sepia tone background. 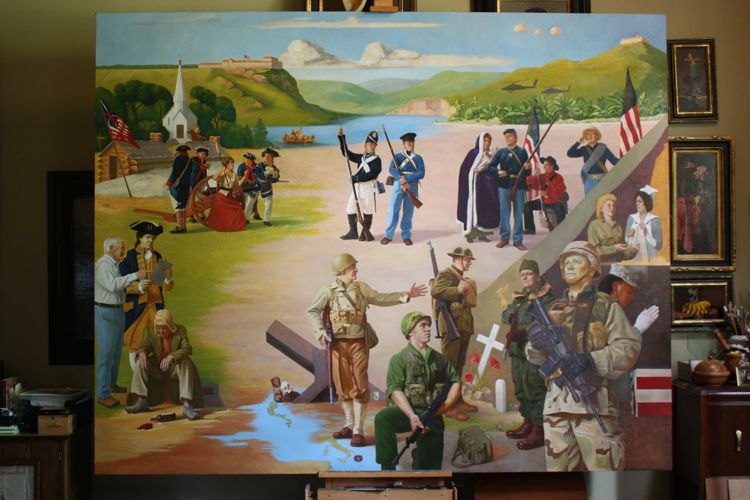 The Minnesota State Veterans Cemetery Memorial Association commissioned Kapsner of Little Falls to design and create five oil paintings depicting the history of the Army, Navy, Air Force, Marine Corps and Coast Guard. The project aims to hang large canvas paintings, which will be 8 feet by 10 feet, in the committal hall at the cemetery near Camp Ripley and Little Falls. 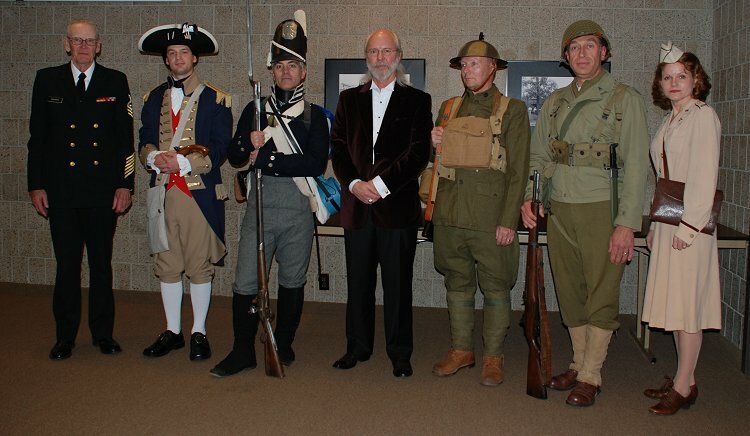 Live models and authentic uniforms from the Continental Army of the nation’s birth to its great wars are helping to tell the story of veterans who sacrificed to support freedom and democracy. A projector helps Kapsner transfer his drawings from studio sittings to the grid-marked canvas. His charcoal outlines of the projected images are then refined with turpentine thinned paint. Eventually, the images will take on even greater nuance as vignettes are added and Kapsner makes use of scaffolding to paint. 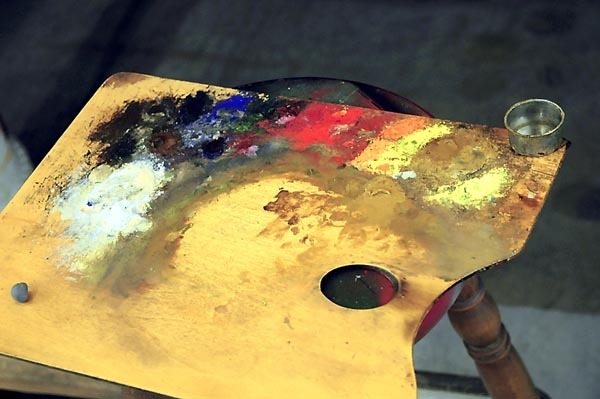 Once the canvas is complete, the extensive details will undoubtedly take viewers considerable time to absorb. The layers of meaning may take several viewings as small details mark significant events over hundreds of years, such as pine boughs marking the pivotal moment of World War II’s Battle of the Bulge. When the project was first announced in 2009, the preliminary sketches gave people a glimpse of what was to come. But Kapsner said for many the project doesn’t seem real until the actual work begins to take shape. 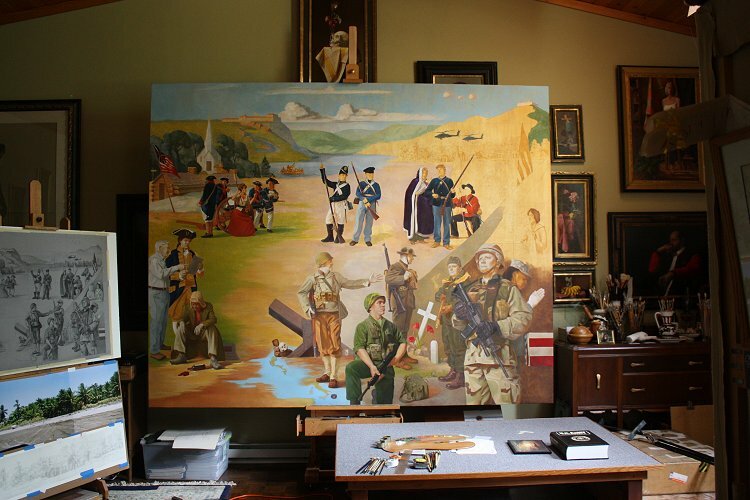 Kapsner, long noted for his fresco work, said decades of art experience and extensive research and travel for each military branch is going into the marathon project. The son of a World War II veteran, Kapsner has tapped into his own appreciation of history and his family background. 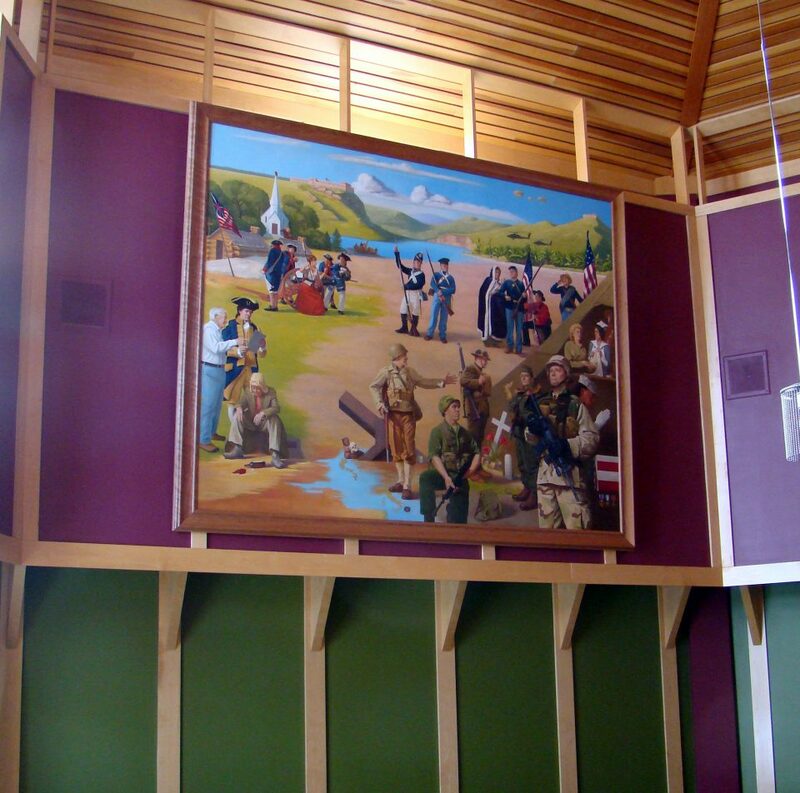 One of the subjects in his painting is wearing his father’s hat and long coat from his military service. Kapsner’s father was at famed Yalta wartime conference where Winston Churchill, Franklin D. Roosevelt and Josef Stalin met and served with the Persian Gulf Command from 1942 to 1945. The Minnesota State Veterans Cemetery Memorial Association commissioned Kapsner for the project, which is expected to cost $495,000 and take four or five years. Friday, Consolidated Telecommunications Co. of Brainerd presented a check for the art project, donating $1,000 a year for five years. Board members from CTC, Paul Nieman and Morris Nelson, made the check presentation. Jack Peck, president of the Minnesota State Veterans Cemetery Memorial Association, said his dream is to sell prints of the paintings to help support the cemetery, noting Memorial Day programs alone cost about $6,000. Peck said there is no administration cost for the project. 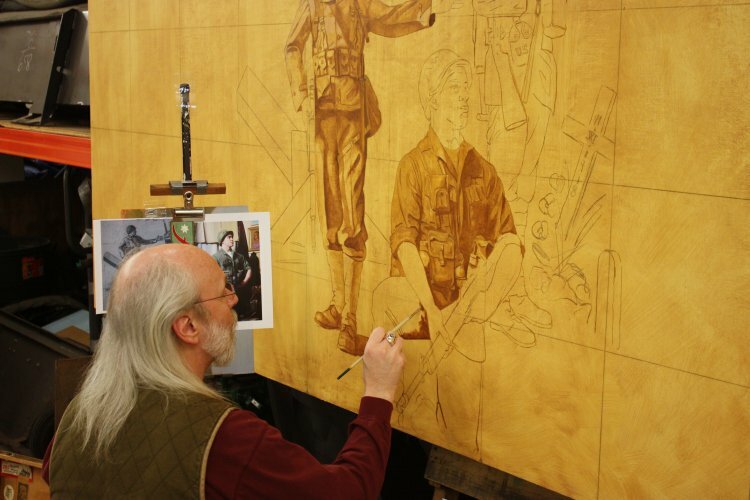 The Veterans Art Project Fund is administered through the Little Falls-based Initiative Foundation. Tax-deductible donations are being sought from individuals, corporations and civic organizations. 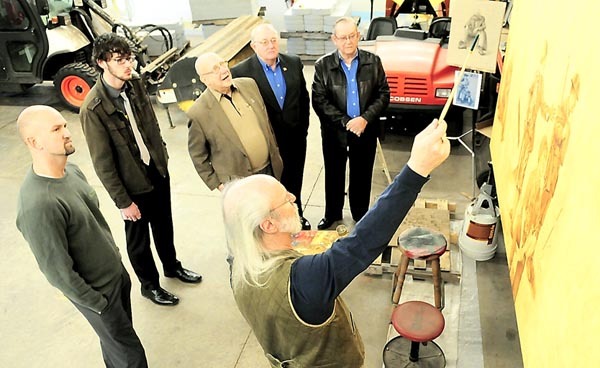 The idea for the art project started with Gordon Gerling, former state representative from Little Falls. Gerling, an Air Force veteran, wanted to see a veterans memorial at the site. A conversation with Kapsner led to the effort seen today. Kapsner considers each painting to be an allegorical piece, telling a story and using those symbolic figures to examine greater truths. Peck said Dave Swantek, cemetery director, has been instrumental in support of the effort. Kapsner is working on the canvas in a maintenance building at the cemetery. Peck, a Navy veteran who served during the Korean War, said the painting details, down to the uniform buttons, are incredible. Peck would like to see prints of the paintings in every high school in Minnesota. Work on the Army painting continues. View color studies and character sketches. The artist posing with models wearing some of the Army uniforms depicted in the painting. This event took place at the Stearns History Museum, St. Cloud, MN — November 14, 2010. By vetsart in Army on April 8, 2013 .